The Pulitzer Prizes will be announced today. 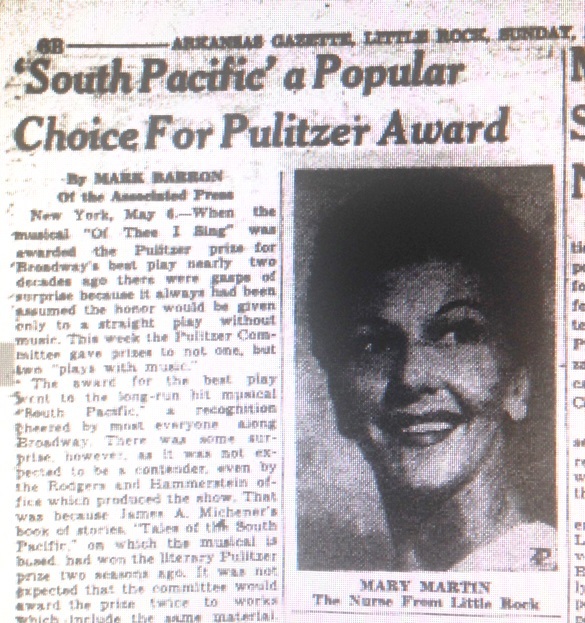 In 1950, one of the recipients in the “Letters, Drama and Music” categories featured a character from Little Rock. In the musical, Nellie struggles with her own prejudices. This issue of prejudice became an instance of fact meeting fiction. In 1957, a few weeks after Eisenhower sent troops into Little Rock to ensure that Central High would be desegregated, a production of South Pacific on Long Island was temporarily halted when the audience booed and yelled after Nellie mentioned she was from Little Rock. This entry was posted in History, Literature, LR Look Back, Theatre and tagged Crisis at Central High, James Michener, Joshua Logan, Little Rock Central High School, Oscar Hammerstein II, Pulitzer Prize, Richard Rodgers, South Pacific, Tales of the South Pacific by Scott. Bookmark the permalink.